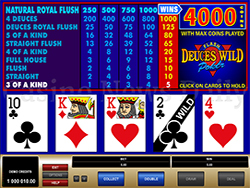 One of the most popular options for video poker players looking to make a profit is with Deuces Wild. When this game has odds of at least 15/9, then it is a great option to have a nice house edge that will benefit the player. For this game, the odds will be based on payouts of different hands than with Jacks or Better. The Five of a Kind and Straight Flush hands help determine the value of the game. Players should look for Deuces Wild games that have a 15 to 1 payout for Five of a Kind and a 9 to 1 payout for a Straight Flush. This particular game of Deuces Wild has a house edge of roughly 99.7%! 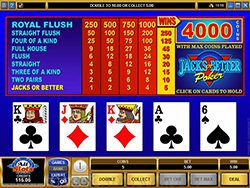 One of the best options for online video poker players is Jacks or Better. This game has a nice pay table and is one of the more popular variants. When you have a good strategy and combine it with the pay table of this game, you can see a return of 99% or higher. When playing Jacks or Better, let the game load and then look at the pay table. If the Full House hand pays 9 to 1 and a Flush pays 6 to 1, then the odds are good for you to play this game. Always review the pay table to see what is offered with the game to know if you are going to have the best odds in your favor. The house edge of Jacks or Better is at around 99.52%. Another favorite video poker game, this option should have odds of 25/8 to provide the best payout for players. The full payout table should show a 25 to 1 payout for Four of a Kind and then an 8 to 1 payout for a Full House. This way, you will have the best odds, though this can be hard to find in online game play. Always check the pay table to see what your options are, comparing games at various online casinos to find the variant with the best pay table. With the best pay table, Aces and Eights has a house edge of 97.49%. Using a basic video poker strategy can help you start to get the most out of your bets. This strategy will help you to choose simple moves to increase your odds of making a profit. If you are an inexperienced video poker player, this is the best place to start. 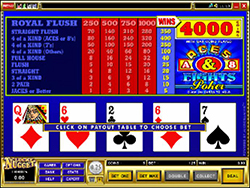 Once you get the hang of the basic option, you can learn more advanced strategies for specific games, such as with Deuces Wild and Jacks or Better. Players should never choose to discard cards if a Straight Flush, Full House, Royal Flush or Four of a Kind can be created. A Three of a Kind hand should see only the remaining two cards discarded. If you are one card from a Royal Flush, consider discarding the card with the lowest value to be able to increase your chances of creating a better hand. Betting the max wager but with a smaller denomination will help you to win but also avoid major losses. By playing several coins in the game, you are able to increase your chances of seeing a win with the hand. Take for example, placing five $1 bets instead of just one $5 wager. This way, your chance of winning the hand is increased and you still earn a nice profit. Part of your betting strategy should be bankroll management. Set a specific amount you wish to spend during your session and stick with it. This way, you will be able to avoid major losses and hopefully end the day with more money in your online casino account. Starting out, just remember to use a basic video poker strategy, choose a game with a nice pay table and set your betting limits. In no time, you will be enjoying the game and hopefully earning a nice payout and adding to your overall bankroll!